Both of these teams played very well in the Eurocup last season and they will both have genuine ambitions of going far this time around. This game gives both teams the chance to size themselves up against top quality opposition and whoever gets the advantage in this game will think that winning the group is in their hands. 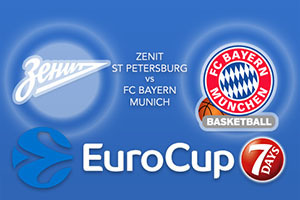 With the second-top Eurocup scorer from last season in their ranks, Zenit will be confident that they can grab points to win games. Ryan Toolson will be an essential player for Zenit this season but it is not as if he is the only player who can make his mark. Stefan Markovic has been around the block and Pavel Sergeev knows how to impact on the game. There is also Sergey Karasev son of Zenit coach Vasily who can get involved so there is plenty of depth in this Zenit squad. With a home crowd cheering them on, Zenit will expect a win tonight. Bayern Munich have a number of fantastic players who can make the difference not only in this game but in the tournament as a whole. Alex Renfroe will be a familiar name to people who have watched European basketball in recent times and he will be supported by players like Reggie Redding, Nihad Djedovic, Anton Gavel and Bryce Taylor. Taylor is the sort of player that can impact on the game at both ends of the court so no matter how the match is panning out, you can expect to see him involved with the action. The Germans will fancy their chances of an away result on Wednesday. Take Bayern Munich at +4.5 which is available at odds of 1.90. This is genuinely a game that can go either way and if the away team settle into a rhythm early on, they may be able to silence the home crowd and impose their own game on the hosts. Anyone looking for the Over/Under market should look to go UNDER 160.5 which is found at odds of 1.90. Bet Now!